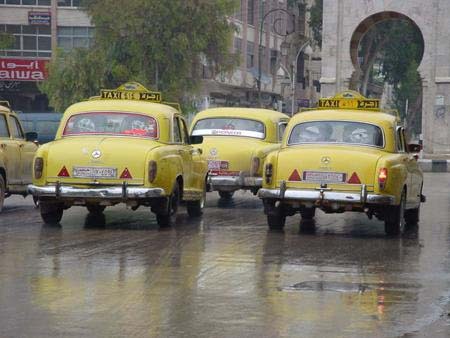 Even today in Syria, these Mercedes-Benz Pontons have to work as taxis. Why use such an old car for modern public transportation? Aside from the fact that the MB Pontons were engineered to be durable automobiles, there is another less obvious answer to this question. Since the 1950s, Syria's economic regime changed from capitalist to socialist and as a result, people were not allowed to buy cars on the open market. Instead, the government bought thousands of cars each year and sold them to the people. For example, in 1975 the government of Syria might have bought only the Peugeot model 504, so anyone who wanted a car would get a Peugeot 504. There would be no other choice. Because of this, owning a car in Syria became a luxury. New cars became too expensive and very old cars became a valuable asset. For example, when someone dies there, his car will be passed on to his children, and they share its ownership. Therefore; durable old cars (whether they are Mercedes-Benz Ponton or Fintail models, Desotos, Buicks, etc.) pass from one generation to another. Originality is not always conserved in these vehicles. You can find a Ponton with a Mazda engine, or with the outside mirror from a different Mercedes-Benz model. They can do anything with a car because necessity requires them to be inventive and resourceful. Nothing is impossible. They are good at mechanical and body work as well as paint work. Parts are very cheap, and you can find anything you need for a Mercedes-Benz Ponton in Syria today.